www.soniccathedral.com = 9/10 points: Long have I believed Finnish fivesome, Unshine, to be one of the most underrated metal bands from that country. I don't understand it. I randomly found them years ago when I was first getting into Finnish metal, and what set them apart for me was their band's description, which was ?druid metal? and ?celtic metal?. Druid metal? From Finland? I had to take a listen, and I loved them immediately. They had a easy going, simpler sound and I loved vocalist Susanna Vesilahti's voice, which has a gentle, sort of husky, sort of shy quality about it. This was back in 2007, two years after their debut album, Earth Magick, was released. It contains one of my favourite songs ever by this band, ?Supergirl?. The follow-up album, The Enigma of Immortals, was even better, showing off a heavier sound and more vocal harmonies, and altogether being slightly more complex in sound and composition. The shining track on that CD for me was the lovely balled ?Forget Me Knot.? So what seems like an absolute age ago, months and months in fact, when Unshine annouced it had its third CD ready to go but where shopping it around to labels, I got so excited I could barely contain myself. Finally, over the winter sometime, they announced that they had signed with Massacre Records, and that the release date of Dark Half Rising would be August 23, 2013. I was impatient and thought that was an awfully long time to wait, especially as I knew other bands had recorded and released material in far less time. But good things come to those who wait, right? And now that I have a copy of the new album, I can happily say that it was worth the agonizing wait, and that this, my most anticipiated album of 2013, was totally worth it. So let's start off with a brief explanation of the Celts, since that is the important context we need to understand before delving further into this album. Most people associate the Celts with England, Wales, Ireland, and Scotland, but the truth is that the Celtic people originated in central and eastern Europe as a large group of interrelated tribes with a common language, and as they couldn't quite get themselves organized into a nation, they wound up being pushed and persecuted farther and farther west, settling in places like and France and Belgium before finally being pushed into the islands of the UK. Their culture has been around for thousands of years, leaving traces of itself all over the place. It's important to understand the connection to France because there are two songs on Dark Half Rising that are concerned with the area of Ardennes, but I'll get to that later. First up, the album begins with an unexpected acoustic folky tune called ?Nadja's Wailing About Coming of the Frost?. 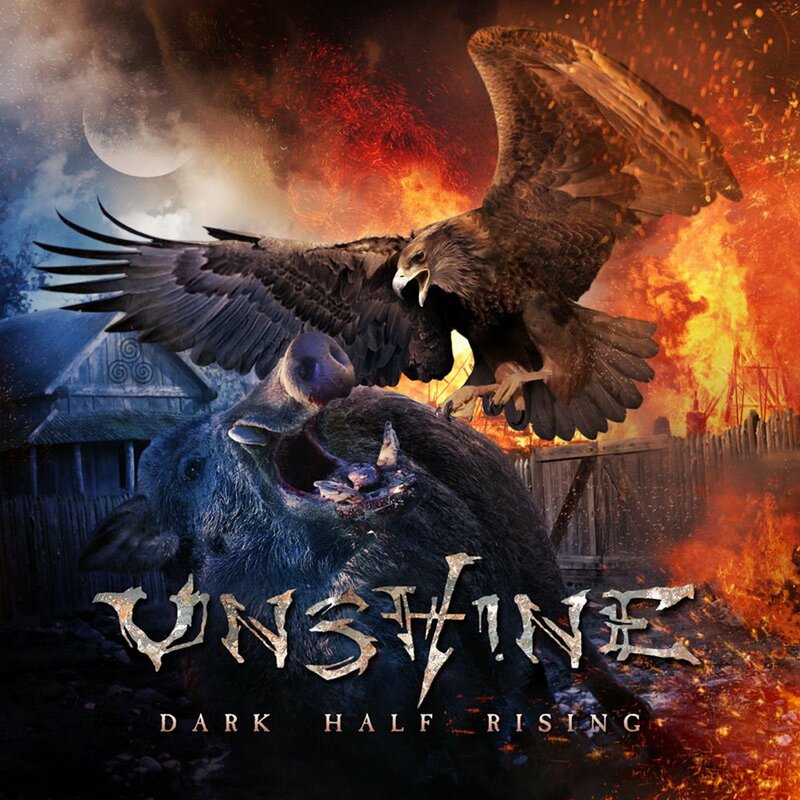 It's a short song that sounds like I could have been sung around the campfires of old, and it's a particularly interesting start to Dark Half Rising because it's not a metal song at all and it's a bit atypical of Unshine's style. But it's a great song nonetheless, and its atypicalness works because this CD is turns out to be quite the step in the evolution Unshine's overall style. Dark Half Rising is their heaviest, most complex, and most epic release to date. I must admit, however, that I didn't receive the song lyrics when I got my promo copy of this album from the label, which is very disappointing because lyrics are usually the most important part of the song for me, and I found the absense of them this time very frustrating because I know there is more going on here than I can tell from just listening along. The second song, ?The Oath to Wilderness of Unredeemed Nature?, starts off with a fast, energetic into, their most bombastic work yet, and it actually sets more of the tone for the rest of the album than the previous song. Gone is the ?gentleness? of Unshine's style I mentioned in the first paragraph, and in comes the aggression, heavy riffing, and speed of the ?new? Unshine. But what remains the same is Unshine's penchant for suberb catchiness. ?Arduinna?, track three, is a great example. This is a song about Arduinna, the Celtic goddess of the Ardennes forest. She was depicted as a huntress weilding a knife on a boar, and if you check out the album art, there is a boar very prominent on the CD cover. Eventually, Arduinna was ?assimilated? as the Roman goddess Diana. This is a catchy song with a hooky chorus that rocks along at a decent speed, and utilizes what sounds like an organ in one part, and also shows off some of Susanna's vocal harmonies. This was one of my favourite songs on the album. ?Arduinna? is also the first of two songs referring to the Ardennes region of France, the second being ?The Blood of Ardennes,? which is track eight. It has quite an theatrical opening, with choirs and symphonic elements, before it trots into a fairly epic song about, from what I can gather, a battle in the Ardennes. Other standout songs on the Dark Half Rising include ?Spellbinder?, ?Defender of His Faith?. There is also a pretty epic song on here clocking in at nearly 13 minutes called ?Ikuinen Taistelu?, which is sung in Finnish. It starts off with a voice over narration and then plunges into what is Unshine's longest song ever. Alas, I have no idea what it's about because I don't speak the language, but musically it's very good, progressive, and as I said, epic. The guitar work on this album is also noteworthy; Harri and Jari Hautala do an excellent job upping the ante with great riffwork and solos. The guitars definitely have more to say in this album than on the previous two. Susanna's voice is wonderful to listen to, as usual, but I even noticed that she's singing a bit higher in this album than she did before, and she sounds great. She's been able to improve her range without sacrificing the charming qualities her vox has. So go Unshine for stepping it up and successfully adopting a new sound and new approach! This is definitely a killer album, and I totally recommend giving Unshine and all their discography a chance because I want this band to be noticed. Their days of being underrated need to end! I'm heartened that they've signed with a major lable in Massacre Records, and this band is unique enough to make it big on the international scene.